Many SUVs in recent years have changed in recent years to become more family-oriented vehicles. With more entertainment features and more interior comfort added, many families have abandoned the minivan for the family utility vehicle. However, in this process, many SUVs have sacrificed performance and utility in this process. Luckily, the 2018 Nissan Pathfinder has done no such thing. But how does the 2018 Pathfinder stack up against its competitors? Let’s find out in this 2018 Nissan Pathfinder vs 2018 Toyota Highlander comparison. In order to guarantee you are getting a completely fair and accurate standard between the Pathfinder and the Highlander, we will be comparing the base trim level for both vehicles. This is the S trim for the Pathfinder and the LE trim for the Highlander, which most closely match up when it comes to price point and range of features. Continue reading to see how these two SUVs stack up in terms of specific features and specifications. 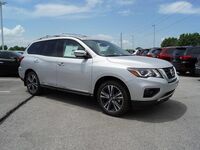 If you are in the Kansas City MO area and are interested in a 2018 Nissan Pathfinder, follow this link to our inventory. This comparison makes it totally obvious that the 2018 Nissan Pathfinder is the better option for those looking for a family utility vehicle. Whether you are looking for optimized performance or unbeatable interior comfort, then the 2018 Nissan Pathfinder is definitely the better option. When it comes to performance in the Pathfinder, it blends performance and efficiency much more effectively than the Highlander. First, with up to 284 horsepower and 259 lb-ft of torque, you are getting a very powerful drive in the Pathfinder. Additionally, with three more miles per gallon on the highway, it will also save you a ton of money at the gas pump at the same time. Additionally, in terms of interior comfort, the 2018 Nissan Pathfinder is designed to keep everyone in the vehicle satisfies. First, with up to 41.7” of rear legroom, rear passengers are sure to stay comfortable on long road trips. Also, with dual-zone automatic temperature control, you and your passengers will be comfortable at their ideal temperature. Interested in a 2018 Nissan Pathfinder?